I haven’t seen a design at Shirt.Woot that I just had to have in a long, long time. When I saw “Flying” by ilovedoodle late last night, I immediately hit the “I want one!” button. Being a huge fan of ilovedoodle, I’ve been waiting to see this print for some time now, and I’m glad that it finally happened! I like happy characters and the whale is smiling like it’s having the best day of its entire life. Penguins are awesome, especially Emperor penguins. Turtles are also cool because I automatically think about Squirt from Finding Nemo. If you don’t know who he is, Google him. He’s adorable. Penguins are finally “flying” in this illustration. There is hope for these flightless birds, after all! I only have about 3 heather grey tees in my entire t-shirt collection. Very sad. Go pick up a copy of “Flying” at Shirt.Woot before time runs out! It’s only $10 and you can get free shipping if you go with the slower option. I can’t wait to receive mine! I hate rain. It’s true. So when I learned about LadyUmbrella, the best images didn’t exactly pop into my head. However, after seeing LadyUmbrella herself, I’m starting to think differently. How cool would it be to never have to actively carry an umbrella again? I guess it would only be beneficial if I were to live in a place where it constantly rains, but it’s still an interesting thought nonetheless! Plus, I’m not sure how having an umbrella head would factor into daily activities like showering and sleeping. Enough of my deep analysis of LadyUmbrella’s weather-proof head… One of my favorite designs on the site is titled “Away with the Birds” and it shows LadyUmbrella walking past a bunch of funky-looking birds. There are also empty birdcages hanging from the clouds. Perhaps it’s a metaphor for setting your mind free while you take a walk. Whatever the reasoning behind it is, I am liking the composition and how it makes me feel! LadyUmbrella plans to launch in early December, so check their site for the latest updates! I hear they’re taking pre-orders before the big launch, too! I’m loving the latest $500 winner at Tilteed this week! 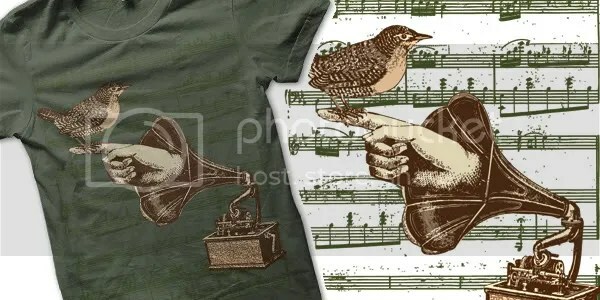 Designed by lunchboxbrain, “Song Bird” features an illustration that’s perfect for music lovers. Although I wish that the sheet music were more visible, it’s still a beautiful piece to look at. You can pre-order this tee for $12 until next Tuesday and get free shipping with the code “LovingThisTee“! Seeing all these animal tees lately makes me miss going to the zoo. 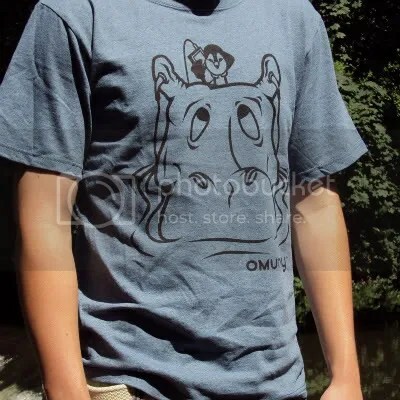 One of the culprits for this is OMUNKY‘s “Harry Hippo” tee. Apparently, this hippo keeps getting his MP3 player stolen by the little bird, and now all of his settings are messed up. I’m thinking that all the music has been changed, too. I wonder what the bird uploaded to the music player… Could it be some pop tunes or some unexpected death metal? The hippo does appear to be a bit surprised, after all! “Harry Hippo” is printed on a recycled cotton t-shirt, and you can pick it up at OMUNKY for $22. Make sure to use the coupon code LOVINGTHISTEE to take 15% off your purchase!